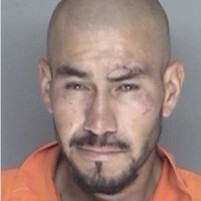 Martinez, an illegal immigrant with an extensive criminal history, was convicted of first-degree murder during commission of a robbery, sexual penetration and use of a deadly weapon during a jury trial that ended in late June. In July 2015, Martinez broke into the home of Pharis, a 64-year-old veteran and Vandenberg Air Force Base employee, while she was sleeping, then beat her with a hammer and raped her. Eight days later, Pharis died in the hospital after blood clots formed in her legs. Martinez, an illegal immigrant from Mexico, had been arrested six times in the 15 months prior to the Pharis killing, according to the Santa Maria Police Department. Martinez was released from the Santa Barbara County Jail 96 hours before he attacked Pharis. During the trial, prosecutors said Martinez beat the Santa Maria woman with a hammer and choked her multiple times. Pharis suffered a broken neck bone and severe bruising, and Martinez’s DNA was found at the scene. Martinez also admitted to police that he hit Pharis, tried to strangle her and “touched her under her underwear,” prosecutors said. Will Mexico be paying us back for his accommodations, 3 squares a day and the guard who will watch him? Life? Are we kidding? Why spend any more money on this fiend? Jeez, our society is really messed up. Lacking the obvious best option of turning him over to the family of the victim he should at least get the needle. Life in prison is to good. Death sentence now.